Considering it took only 10 hours for the 7th and 8th edition to be sold out almost a year in advance with not a single band announced, proves that Punk Rock Holiday has truly become one of the most anticipating events in Europe to those who have once experienced a different meaning of a festival. This year we are taking a different approach regarding ticket sale and tickets are still available! Camping in the shade of the trees, surrounded by mountains, a meditereanean climate, 2 festival owned beaches, main stage in an avenue of trees, no barricades between bands and audience and a Beach stage on a so called paradise beach should give you the impression of how amazing this festival really is. Not only the festival offers a tasty selection of amazing bands, but also the whole relaxed atmosphere on one of the most exceptional festival locations in the world makes Punk Rock Holiday an unforgettable experience. There is a possibility to withdraw money from an ATM machine, that will be placed on the festival area, near the festival Info point. Together with the bank, that will be providing the ATM machine, we will do our best to work closely together in order to ensure, the ATM will always have enough cash to supply it to our visitors. Camping is available to festival guests free of charge from Tuesday, 6.8.2019, but is a subject to possession of a valid festival-ticket! Camping is at one's own risk, festival promoter accepts no responsibility in any case! For children under the age of 12, the entrance is free. Please note, that children can only enter the festival grounds if accompanied by a parent or legal guardian - with a valid Punk Rock Holiday Festival ticket. Children of all age are very welcome at our festival, but be a responsible parent or legal guardian and make sure your children wear sound protection at all times when being near or in front of any stages or in areas where music is loud! Please also keep in mind, that earplugs that are used on the festival area a lot by adults are not an efficient and sufficient sound protection for those little fragile ears. The only sound protection that should be used are the real sound protectors (headphones). Wearing sound protection as written above is mandatory; so we have to remind you that anyone who will try to disobey this very strict rule, will be removed from the festival area with revoked access, without any further explanation. Every cup (glass or bottle) is a subject to deposit upon which your Punk Rock Holiday PayCard will be charged 1€. Every time you order the "first" drink, your Punk Rock Holiday PayCard will be charged with 1€ deposit. For every next drink your Punk Rock Holiday PayCard will not be charged another deposit but you have to have your “old” cup with you and you need to give it to the bar personnel. They will simply give you new a one with every next drink. To get your cup deposit back, you need to bring your Punk Rock Holiday PayCard and empty cup to the cup deposit point. Amount of empty cups/containers has to match with amount of deposits that your Punk Rock Holiday PayCard has been charged with. Early arrival is a subject to Early Arrival fee 30€ for arriving on Saturday or 20€ for arriving on Sunday or Monday with possession of a valid festival ticket! • there will be no First aid team available on festival area, neither will there be any life guards on the beach or near the river area. Please also note, that those of you, who will arrive to the festival early and buy yourself an Early arrival ticket, can not reserve camping grounds for your friends, who are planning to arrive after Early arrival time! We will remove all tapes or any signs of reserved camping space whatsoever. VIP & PRESS AREA will be open MON – SAT from 12.00 – 02.00. In order to be granted with Punk Rock Holiday wristbandit is mandatory to pay the Garbage Deposit, unless you are not staying in Punk Rock Holiday camp. As it’s name says, it is a deposit, which means that you get the money back once you return full garbage bags to the garbage point. More information about garbage deposit system here. If you stay in a hotel or apartment, please take a proof of your accommodation with you to the wristband office. If you stay in a hotel or apartment and you do not have proof of accommodation with you, you will need to pay garbage deposit. …But don’t worry, you have a whole week time to verify that you are not staying at the festival camp. With the verification, you’ll get your money back and you won’t need to return full garbage bags. Please, really try to keep the festival area and the surroundings clean! Use the garbage bins that will be placed throughout the festival area and take note of the marked recycle bins also. Step 1. Upon arrival you will receive your PayCard. It is mandatory! Step 2. Load your PayCard with 20€ or 50€ only. Step 3. Our personnel is going to deduct 15€ from your PayCard for garbage deposit (10€) and Punk Rock Holiday PayCard deposit (5€). Step 4. Return your full garbage bags to the one of the garbage points during the festival time. For garbage points working hours please go here. Step 5. Upon returning of garbage bags to the garbage points your PayCard will be loaded with 10€ (garbage deposit). Step 6. Upon returning your undamaged PayCard to one of the PayCard points, you will get 3€ returned in cash (PayCard deposit). 2€ will be kept as service commission fee. 1. DON’Tlet it runall day and especially not at night. 2. MIND THE EXHAUST FUMES of your generator, take precautions when setting it up! 3. NEVER let the generator blow exhaust fumes into tents or cars! 4. NEVER leave the generator running unattended! The wind direction may change suddenly! There have been deaths reported referring to people breathing generator exhaust fumes while sleeping on a festival!!! Please note, that it is forbidden to use a generator from 3.00 to 9.00, when there is Silent time at the Festival camping area! 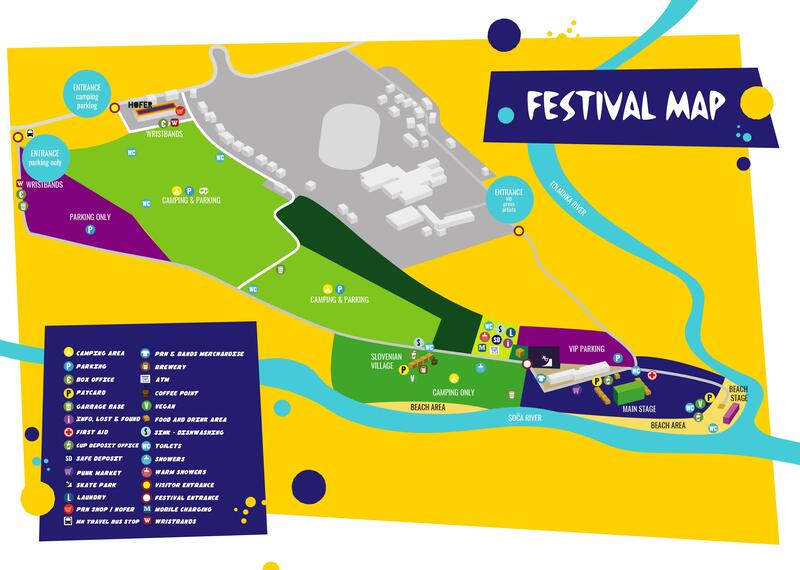 Click here for a detailed view of the 2019 festival area. You will be provided with variety of food and drinks of good quality at a big number of stands, adequate in quantity and pricing. Furthermore we provide you with wide variety of vegetarian and vegan dishes, there will be also some gluten free food available. Beside that we will have free drinking water which will be provided all over the area. At the camp area, you can use your own bottles for refilling the drinking water. But at the venue area, you are not allowed to take any bottles with you, so you need to buy water at the bars and after that refill it at the water points as often as you want. Please also note, that once you leave the venue and want to enter the venue again, you will not be allowed to bring the bottles in the venue area, so you need to buy the bottle again! Please be advised, that the shower center has limited capacity and it operates in the principle: first comes, first serves. In practice this means that hot water is available at all times, but if the capacity of the shower center is full, you will have to either stay in line for your turn or use the cold showers. Wheelchair users or other physically handicapped people who rely on support, can bring 1 escorting person to the festival area for free. They are allowed to use the VIP camping grounds, which enable an easier passage to the festival area. Handicapped accessible restrooms will be available. Please notice, that due to lack of space, Punk Rock Holiday does not provide platform for handicapped people in front of stage. Please note that an official medical certificate will be demanded upon your arrival! Festival Info point, located between camping area and main stage area, offers basic info about the festival, such as information about running order and possible changers, signing session hours and all other festival related news. You can also deposit things that you have found or leave a note if you have lost something. At the festival Info point there is also one representative of our Security crew, that will be happy to answer all your questions, complaints or ideas about security at the festival area. Even if you just feel you need to say thank you or some good words about them - feel free to stop buy. They will be happy to help you out. • Drop off point: Slovenian village. If you want to use this service, you will drop off your luggage at Main festival entrance, where you will receive a sticker with the same number as number attached to your luggage (just like on the airport). With the sticker, you will be able to identify yourself to our personnel at drop off point and at the same time identify your luggage. We do need to emphasise however that festival promoter, PRH d.o.o., does not take any responsibility for lost, displaced or damaged luggage! There will be a limited edition of Punk Rock Holiday festival shirts and other Punk Rock Holiday merchandise and Artist merchandise available at the official Punk Rock Holiday merchandise stand. Important note: payment method is cash only! Upon arrival with car, please follow signs for "Punk Rock Holiday" parking, that are placed already on the main road towards the festival area. Parking and camping at the festival area is permitted only on designated places, so please follow the instructions of the parking security personnel. The parking fee for complete festival is 20€. If you wish to park next to your tent in the Parking&Camping area, parking for the whole week will cost you 30€ per car. ATTENTION! We don't offer any special perks like electricity for the camper vans! Camper vans are charged 30€ in the parking and camping area. All prices are for 1 vehicle, regardless of the number of passengers. Parking fee can be purchased/payed at the festival entrance only. Please note that the parking sticker should be placed onto the INNER LEFT SIDE of your vehicle's windshield, where it is easily visible! As many of our regular visitors are already aware, Punk Rock Holiday festival is running on cashless payment system - Punk Rock Holiday PayCard. Please click here for Punk Rock Holiday PayCard Terms & Conditions! Upon arrival you will be charged 5€ for Punk Rock Holiday PayCard deposit. You will get 3€ deposit back once you return your Punk Rock Holiday PayCard undamaged to the one of Punk Rock Holiday PayCard points. 2€ will be kept as service commission fee. Dogs and other animals are NOT permitted to the festival area! Anyone who will try to disobey this very strict rule, will be removed from a festival area with revoked access, without any further explanation. Please behave responsibly towards your animal companion and leave them at home (or in any other dog hotel or care, that will provide them the care they need). Photographing is allowed for your personal use only. Surely, you do understand that due to contractual obligations, the use of professional photo equipment such as flashes, video cameras and alike by our visitors, is NOT allowed on the festival area. Possession and use of such equipment without valid photo accreditation is a subject to a fine or revoked access to the festival area. At the festival area it is prohibited to bring: cans, bottles, hard drugs, objects that can be used as projectiles, knifes, and of course any kind of weapons and other objects that can be used as such. Leave those things at home; you won't be able - in any case - to get into the festival area with them! Of course, you are allowed to bring your cutlery to the Camp Site, but not to the Stage Site! We believe that our visitors are our friends and we also try to treat you all like that. But sometimes it could happen, that some of our visitors are not behaving as such - and we would like to know that. Therefor we have created a simple form on our webpage, that will be active during the festival time only, where you can report any kind of illegal activities you spot on the festival area. You can find it here. We would like to make sure all our visitors are safe at all times and feeling welcome as well, so with reporting any kind of illegal activities you spot on the festival area, you are helping us a lot in terms of keeping you and your mates safe. We would like to thank you for your cooperation in advance. Every visitor participates in the festival at his own risk. Besides, every visitor is obliged to take action for the warranty of his own safety. The visitor is also responsible for his property. The promoter, PRH d.o.o., is not liable for any lost or damaged property whatsoever! The promoter, is also not liable for violations of the Slovenian law, thievery, injuries or damages by third parties that happen in course of the festival. Running order will be available later. Please be advised, that Safe deposit has limited capacity and it operates in the principle: first comes, first serves. In practice this means that if capacities are full, you can not use the Safe deposit. The same principle works for GSM Charging point; there is a limited amount of charging points/powerbanks, that we can offer for charging. If capacities are full / powerbanks are not available, you can not charge your phone at the time or leave your phone for charging at the station. We will try to provide enough Safe deposit capacities and GSM charging points for all. Please keep the toilet and shower facilities clean so also other people can use them conveniently after you! The instructions of the security personnel are not to be followed voluntarily but OBLIGATORY! Please, avoid senseless annoying actions so everybody will feel comfortable! At the festival Info point there is also one representative of our Security crew, that will be happy to answer all your questions, complaints or ideas about security at the festival area. Even if you just feel you need to say thank you or some good words about them - feel free to stop buy. They will be happy to help or listen. Festival promotor cooperates with 3rd party shuttle service provider, that offers shuttle services from nearby airports and other destinations to the festival area. You can find more details at the travel section of our page. Swimming and other sports are at everyone's own risk! Festival promoter ensures, that there is a professional life guard available at the main festival beach area. Punk Rock Holiday 1.9 tickets are available on our online shop: https://www.mhshop-online.com/c382/prh-19 and are also available at beach stage bands that are listed below. Running clean water for drinking is provided all over the festival area free of charge. At the camp area, you can use your own bottles for refilling the drinking water. Please note that you are not allowed to bring any bottles to the venue area! You need to buy a bottle of water at the bars and after that refill it at the water points as often as you want. Please also note, that once you leave the venue and want to enter the venue again, you will not be allowed to bring the bottles back in the venue area! Q: Will there be WiFi available on Punk Rock Holiday, and where? A: Yes, we will have WiFi hotspots at bars, food stalls and the Cantina. Please mind, that it’s not very easy to provide a stable connection in a national park. It should be sufficient for staying connected with your friends, though, and for using the app functions that require an internet connection. Q: Will the PUNK ROCK HOLIDAY 2019 be sold out? Q: Are there separate tickets for camping and parking? A: Yes. The camping is included in the ticket price (and Early arrival is payed separately for those, who want to arrive early), parking tickets can be bought at the festival entrance. Q: Can I camp at PUNK ROCK HOLIDAY without attending the festival? A: No, to camp and park at the festival requires the possession of a valid festival ticket. Q: Can I park my vehicle next to my tent? A: Yes, at the Camping & Parking area only. Q: Does Slovenia require any specific entry documents? A: Since Slovenia is part of the EU, visitors from other EU countries do not need any specific documents. Visitors from no EU-countries should check with their local embassy to avoid complications. Q: What currency is used in Slovenia? A: The sole currency in Slovenia is the Euro. Q: Do children get free admittance to the festival? A: Yes, for children under the age of 12, the entrance is free. Please note, that children can only enter the festival grounds if accompanied by a legal guardian. Q: Can underage visitors enter the festival area? A: Yes, but only if accompanied by a legal guardian. Q: Are pets allowed at the festival/camping area? A: No! Pets are strictly prohibited at the festival. Please understand, that a festival is not the right place for a pet. Q: Is open fire allowed on the festival grounds? A: Open campfires are strictly prohibited. Using a grill is allowed, but please make sure to use the authentic equipment. Q: Are glass bottles/containers allowed on festival grounds and the camping area? A: No, all kinds of glass containers are forbidden at the festival. Q: Does the festival provide cash-dispensers? A: Yes, there is an ATM machine at the festival area. Q: Where can I purchase PUNK ROCK HOLIDAY merchandise? A: At the festival's merch-stand, located at the Main Stage entrance. PayCard is the only payment method available for Punk Rock Holiday; the exception is the official festival merch, cigarettes and fan articles at the festival market, which you are able to purchase with cash only. PayCard is mandatory for every visitor! You will receive your PayCard together with your festival wristband. The minimum amount of the initial credit load is 20,00€, which you need to load at the entrance to the festival at the Box Office point, in order to receive your festival wristband and PayCard. The minimum amount of each credit reload is 10,00€. The maximum amount of the initial credit load is 100,00€. The maximum amount of each credit reload is 100,00€. You may load your PayCard only by paying in cash at any cashier. You may add funds called “Credit" to your PayCard at any time. You will have access to your credit at any time. You are responsible for all authorized transactions initiated and fees incurred by use of your PayCard. If you permit another person to have access to your PayCard, we will treat this as if you have authorized such use and you will be liable for all transactions and fees incurred by those persons. You are wholly responsible for the use of each PayCard according to the terms and conditions of this Agreement. If you did not spent all your money, and would like to get it back, simply go to cashier and you will receive the amount that is still on the PayCard in cash. If you need to replace your PayCard due to non-funcionality/damage, please go to cashier to request a replacement PayCard. Your PayCard deposit will be deducted and remaining credit will be transferred to the new PayCard. You will be charged with 5€ deposit for the new PayCard. You should get a receipt everytime you make a payment by using your PayCard. You agree to retain, verify, and reconcile your transactions and receipts. (4) To our employees, auditors, affiliates, service providers, or attorneys as needed. (3) If an electronic terminal where you are making a transaction does not operate properly, and you knew about the problem . (9) Any other exception stated in our Agreement with you. Please pay attention to empty your PayCard, so that there will be no loss for you. Camping is at one's own risk, festival promoters accepts no responsibility in any case! We are offering you the advanced group camping booking for minimum 20 persons per group. Contact: groupcamping@mymusicholiday.com. With applying, please provide the following details in an e-mail: tent size (3 or 4 + persons), number of cars (vans, campers, motorbikes,...), number of people in application (min.20 people) and - festival ticket details (either ticket number or Order ID number). Please note, we will keep your group camp ground reserved only until Sunday, 4.8.2019, till 18.00. After that time it will be open to all guests. The official arrival day is August 6th, 2019, starting at 8.00 a.m. This year it is possible to arrive on Saturday August 3rd at 8 a.m. We will charge 30,00 € Early Arrival Fee for Early Arrival on Saturday 3.8. and 20,00 € for Early Arrival on Sunday, 4.8.2019 or Monday, 5.8.2019. Fee covers the extra 2/3 days of camping and a pass for a Warmup Show. NEW!!! RENT YOUR ECO TENT HERE! -Orders are limited to 300 only! COMFORT AREA will be open Monday – Friday from 12.00 – 02.00. *There are 90 pre-order hook ups still available. Upon arrival, please inform our personell at the box office that you need help with electricity hook-up. They will give you all needed instructions. Hooking up will be done by our technician. You need to show him proof of payment. He will also provide his contact, so you can reach him in case of any problem. We provide a 230V supply, which can power most of the appliances you might use at home. However, we have restricted supplies, rated at 6A each, so you need to be careful what you use to avoid ‘tripping out’ the system. Tripping the electrical supply can make you unpopular on site. The least you will need to do is contact the site manager to ask him to reset the system. In cases of “extending” your supply to your friends you will also have stopped the electricity supply to your friends’ pitches. Make no mistake about it. Electricity can be dangerous, especially in the damp conditions of a tent or in the open air. Even a 12V battery can give you a nasty shock if used incorrectly. Used in the right way however, you can benefit from mains electricity and, if you take the right precautions, you can use it safely. We recommend you use a cable length of 25m, because the layout of pitches means you can be pitched a fair distance from the hook-up bollard. However, if you’re closer to the bollard, you should still uncoil the full length of your cable, to avoid it overheating in use. Avoid using extension cables. If you need to, always use weather-proof connectors and keep the connection off the ground – to avoid water getting inside. Many tents now include a small zipped flap where the cable can enter the tent, so cables don’t need to cross the entrance. Most caravans, motorhomes and folding campers have electrical equipment fitted by design. If you are bringing electricity into a tent you will need to buy a special hook-up lead with two or more damp-proof sockets, each of which will take ordinary 13A plug, as you would use at home. Every outlet has own RCD. One of the reasons for using a properly-designed electrical connection to your unit is that a Residual Current Device (RCD) safety device will be wired into the circuit. This is designed to cut off the supply immediately in the case of a leakage of current to earth. Such a leakage can occur when someone touches an appliance that is damp. Particularly if the person is standing on damp ground, which can easily happen in a tent. Tents, and particularly the floors of tents, can be damp and moisture and electricity do not mix. The socket end of the cable will usually have some means of fixing it well above level ground. Often special clips will enable it to be fixed to a frame tent pole off the ground. Arranging to mount it off the ground in other tents, especially those with flexible poles, can be more difficult. The equipment you plug in must also be placed safely. Don’t use electrical equipment on the tent floor as leaks or condensation could lead to dampness. You’ll also need to think about the equipment you want to use on site. At home you’ll probably have plenty of sockets and it’s rare to overload them, but a campsite socket can be easily overloaded. If you are using an electric kettle it really ought to be a small camping one. Heaters should be low powered and ideally designed for camp life, and don’t try to run your heater and kettle together – you could overload your pitch socket causing it to cut out and you may even cut out other sockets on the campsite. If you’re driving to Tolmin, use these coordinates on google maps and it will bring you directly to the festival entrance. The nearest airports to fly in are: Ljubljana, Venice and Trieste. For all additional information or inquiry, they are available though email. Please be advised, that Shuttle Markun is a standalone company and are operating shuttle transfers independently from organisers of Punk Rock Holiday. If you’re looking for the most fun ride to the festival and back, our frinds from Brakrock Ecofest are organizing a coach ride from Duffel Belgium through Germany and back. If you plan to take a train from Ljubljana, you will arrive to Most na Soči station and you will need to take a bus to Tolmin.